Over the past 24 hours, crypto markets have been receiving significant amounts of capital coming from fiat currencies. Global market capitalization has increased in nearly $10 billion, or about 8%, with tokens from the top 10 leading the way clearly. 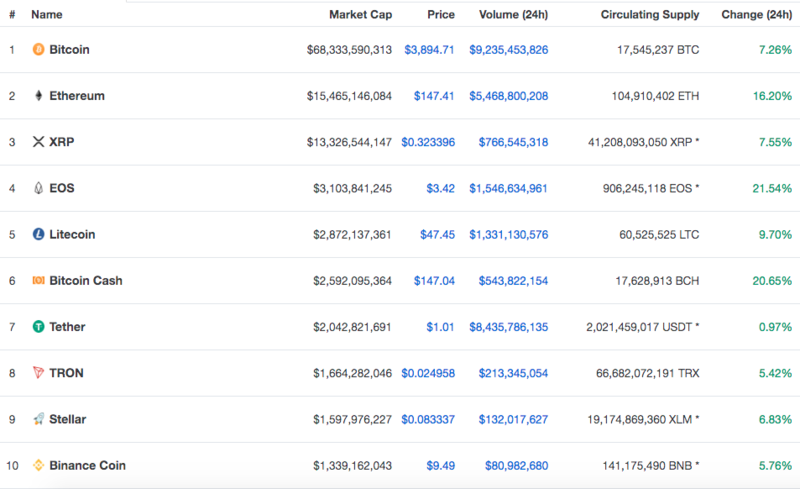 Bitcoin Cash is leading the group of the top 10 cryptos by market capitalization, with a sudden surge towards 16:00 GMT that helped the project add about $500 million in just about one hour. $BCH is now up 20% in the last 24 hours. Ethereum, EOS, Cardano and Bitcoin SV are performing strong as well. $ETH has seen its price surging over 16%, while EOS is the biggest gainer of the top coins with 22%. ADA and BSV are up over 10%. Bitcoin broke the $3900 just now. Binance is back on $1.1b+ 24h volume. The best performing coin of the day this far has been Veritaseum, increasing its market cap by more than 30%, followed by WAX at a certain distance, with gains of about 27%. On the other side of the table, ARK has been unable to hold all of its gains from the last days, losing almost 11% at writing time and therefore becoming the worst performing project of the day (after being the best performing one day ago). The current bull run is serious enough as to only leave 6 projects in the red area of the table for the first 100 by market capitalization, with 3 of them being stablecoins. Read more: WAX + ARK up 50%; ETH leads the top 10 up 10% | Is bear season over?